Established in 1976, Koshi Tappu Wildlife Reserve is 175 sq. kilometers of wildlife refuge and wetlands habitat. It is located in Eastern Nepal, and can be accessed from the Mehendra Highway. The reserve currently has five elephants. The reserve is also home to the water buffello (called arna), deer,nilgai,mugger crocodile,ganges river dolphin (also called the Gangetic Dolphin), and over 280 species of birds.In additional to wildlife, the Reserve also protects a substantial part of the sapta koshi, (a tributary of the Ganges River) flood plain. In 1987, it was declared a Ramsar site. Koshi Tappu is a rectangular shaped reserve, approximately 10 km wide and 10 km long, stretching northward from the Nepal/India border along the Sapta Koshi River. The Sapta Koshi is one of the three main tributaries of the Ganges. Because of its destructiveness during monsoon floods and attempt has been made to control the waters by constructing 7-10 m high embankments parallel to the river. These prevent lateral spread of the enormous monsoon flow. Control gates at the Koshi Barrage on the border with India act as a dam and also contain the river. Rapid and complete inundation of the reserve to depths ranging from 10 to 300 cm occurs during the monsoon. The river also changes its main course from one season to another. The vegetation is mainly tall khar-pater grassland with a few pater grassland with a few patches of khair-sissoo (Acacia catechu albergia sissoo) scrub forest and deciduous mixed riverine forest. The reserve offers important habitat for a variety of wildlife. The last surviving population (about 100 individuals) of wild buffalo or arna (Bubalus arnee arnee) are found here. 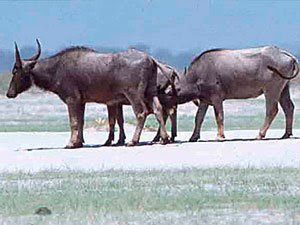 They are distinguished from domestic animals by their much bigger horns. Other mammals occurring here are hog deer, wild boar, spotted deer and blue bull. The reserve also assists the local economy by providing fishing permits and allowing the collection of edible fruits and ferns in season. A total of 280 different species of birds have been recorded in the reserve. These include twenty species of ducks, two species of ibises, many storks, egrets, herons and the endangered swamp partridge and Bengal florican. The Koshi Barrage is extremely important as a resting place for migratory birds and many species recorded there are not seen elsewhere in Nepal. The endangered Gharial crocodile and Gangetic dolphin have been recorded in the Koshi river.